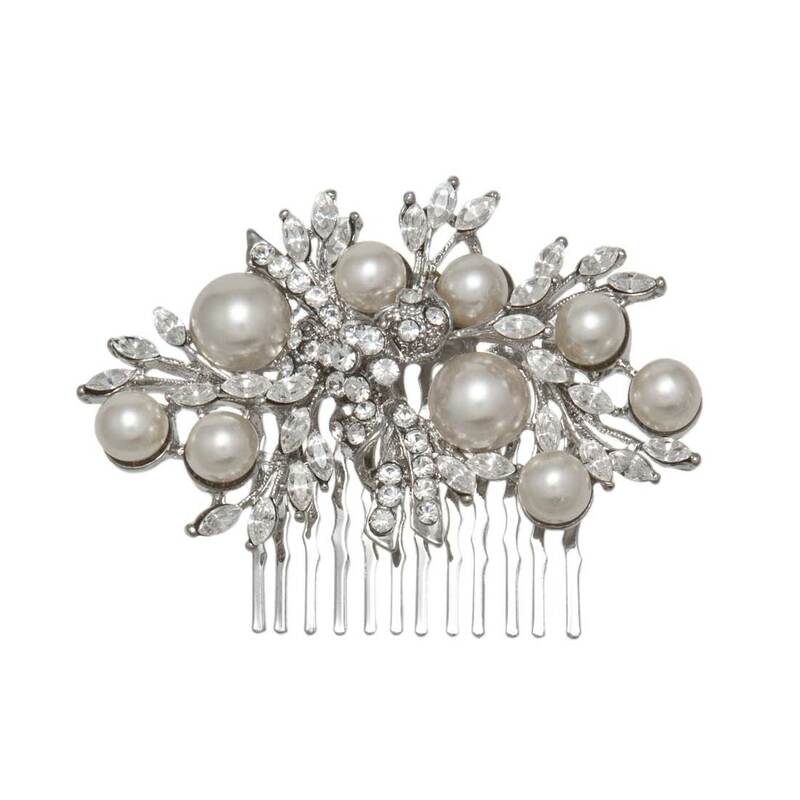 Adored by our brides, this beautiful hair comb blends vintage romance with timeless class. 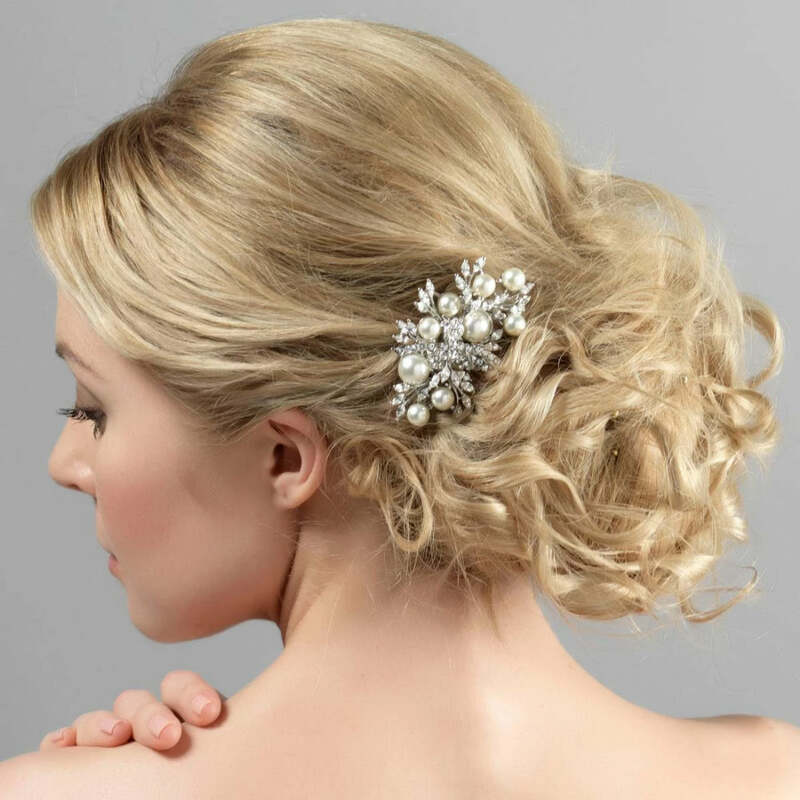 Romantic and enchanting, this silver tone hair comb is exquisite. Adorned with captivating crystal and ivory faux pearl encrusted leaves and stems, it takes inspiration from vintage hair combs and headpieces from the glamorous 1940s with a hint of Edwardian intricacy. This comb looks divine worn in a low side bun for feminine movie star style or in a chic up-do for elegant sophistication. Add a little classic glamour to your hair for a special occasion, simply coordinate with a pair of chandelier earrings and a gem encrusted bangle for chic style. Perfect for brides who adore the classic romance of vintage wedding hair accessories, this beautifully compliments an antique inspired gown. For a dramatic look, coordinate with a bold necklace and earrings or, for added sparkle, add Enchanting Pearl Hair Pins. I bought this hairpiece for my wedding and it looked absolutely amazing! I got so many lovely compliments on it on the day. The comb is of very good quality and solid weight and stayed firmly on through the whole day and evening. A beautiful hair comb which will go perfectly with my wedding attire. The quality is outstanding. I saw this quite a while ago but kept looking and have now come back to it as there wasn’t anything I loved more. I cannot wait to see what it look like on the big day. The delivery was very prompt after the order was made and have arrived in perfect condition in a pretty pink & black box. Absolutly perfect, arrived in perfect condition so quickly and looked exactly as viewed on the website. I was so happy to wear this on my wedding day. This is a beautiful piece of hair jewellery. I can't wait to wear it at my wedding. Fast delivery, even to NZ!